Centella asiatica is a tropical plant that has been used extensively in Indian medicine. It has diverse applications for skin cosmetics: firstly, it is effective in wound care, as it promotes healing of simple, infected, non-healing, or burn wounds, as well as wounds in patients with diabetes, undergoing radiotherapy or steroid medication. Centella is also used for treating scars and preventing or reducing stretch marks. The extract of this plant promotes synthesis of collagen, hydroxyproline, hyaluronic acid and cell growth factors, thus helping to maintain the elasticity, strength and general appearance of healthy skin. It also protects the skin from ageing damage, such as glycation, and UV damage, likely by activating antioxidant synthesis. NOTE: To assist you with solubility issues, we now also sell Centella asiatica as a standardized pre-dissolved solution. Just add the liquid to your cream and mix well. 15% solution gives 1% triterpenes content in final product. 43% solution gives 3% triterpenes content in final product. 72% solution gives 5% triterpenes content in final product. Centella asiatica is a tropical herb, growing in the tropical regions of America, Africa and Asia, where it is also called Gotu kola. Its extracts are used in various pharmaceutical and cosmeceutical preparations, designed for a wide range of purposes. Centella is well-known in Indian medicine, where the extracts are used to treat eczema, psoriasis and even syphilis, while others report its antidepressant and analgesic power . The pharmacological effect of these extracts is ascribed to three chemicals – asiatic acid, madecassic acid and asiaticoside . Foremost usage of Centella is in wound care. It may be used to treat non-healing and infected wounds, scars, burns and even alleviate radiotherapy damage , . In rats, applying Centella cream three times a day for 24 days even on open wounds increased cellular proliferation and collagen synthesis at the wound site, making them heal faster . An increase in collagen content and tensile strength were also observed. In guinea pigs, asiaticoside was also found to improve the amounts of collagen, together with faster healing . Asiaticoside was effective even against delayed-healing wounds in both human and animal studies with no observed side effects, marking the importance of Centella for diabetes patients , . 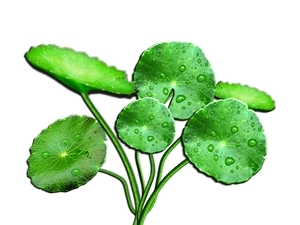 Centella asiatica can also overcome the anti-healing effect of steroid drugs . Centella can be combined with other ingredients to achieve synergistic effects. A herbal ointment containing Centella and other plant extracts was found to improve the appearance of dermatitis patients’ skin under dry or cold weather conditions . Combined with onion extract, Centella cream has successfully improved the stretch mark appearance, as evaluated both by participating women and the researchers . Similar effect (reduced severity of stretch marks and even prevention) was found using a cream where Centella is combined with other ingredients, such as vitamin E, suggesting that the extract of this plant is responsible for the primary effect in scar treatment . Addition of vitamins A, E or C also strengthens the collagen-promoting effect of Centella . In patients with photoaged (UV-damaged) skin, dermally applied madecassoside (extracted from Centella) and vitamin C preparation resulted in a significant improvement in firmness, elasticity and skin hydration, confirmed by objective measurements . Finally, recommended usage of Centella extracts is 1 % in cream or 2 % in powder form . B. S. Shetty, S. L. Udupa, A. L. Udupa, and S. N. Somayaji, “Effect of Centella asiatica L (Umbelliferae) on normal and dexamethasone-suppressed wound healing in Wistar Albino rats,” Int. J. Low. Extrem. Wounds, vol. 5, no. 3, pp. 137–143, Sep. 2006. W. Bylka, P. Znajdek-Awiżeń, E. Studzińska-Sroka, A. Dańczak-Pazdrowska, and M. Brzezińska, “Centella asiatica in dermatology: an overview,” Phytother. Res. PTR, vol. 28, no. 8, pp. 1117–1124, Aug. 2014. W. Bylka, P. Znajdek-Awiżeń, E. Studzińska-Sroka, and M. Brzezińska, “Centella asiatica in cosmetology,” Adv. Dermatol. Allergol. Dermatol. Alergol., vol. 30, no. 1, pp. 46–49, Feb. 2013. Sunilkumar, S. Parameshwaraiah, and H. G. Shivakumar, “Evaluation of topical formulations of aqueous extract of Centella asiatica on open wounds in rats,” Indian J. Exp. Biol., vol. 36, no. 6, pp. 569–572, Jun. 1998. A. Shukla, A. M. Rasik, G. K. Jain, R. Shankar, D. K. Kulshrestha, and B. N. Dhawan, “In vitro and in vivo wound healing activity of asiaticoside isolated from Centella asiatica,” J. Ethnopharmacol., vol. 65, no. 1, pp. 1–11, Apr. 1999. V. Paocharoen, “The efficacy and side effects of oral Centella asiatica extract for wound healing promotion in diabetic wound patients,” J. Med. Assoc. Thail. Chotmaihet Thangphaet, vol. 93 Suppl 7, pp. S166–170, Dec. 2010. P. Hashim, “The effect of Centella asiatica, vitamins, glycolic acid and their mixtures preparations in stimulating collagen and fibronectin synthesis in cultured human skin fibroblast,” Pak. J. Pharm. Sci., vol. 27, no. 2, pp. 233–237, Mar. 2014. A. Shukla, A. M. Rasik, and B. N. Dhawan, “Asiaticoside-induced elevation of antioxidant levels in healing wounds,” Phytother. Res., vol. 13, no. 1, pp. 50–54, 1999. G. Maramaldi, S. Togni, F. Franceschi, and E. Lati, “Anti-inflammaging and antiglycation activity of a novel botanical ingredient from African biodiversity (CentevitaTM),” Clin. Cosmet. Investig. Dermatol., vol. 7, pp. 1–9, 2013. E. Jung, J.-A. Lee, S. Shin, K.-B. Roh, J.-H. Kim, and D. Park, “Madecassoside inhibits melanin synthesis by blocking ultraviolet-induced inflammation,” Mol. Basel Switz., vol. 18, no. 12, pp. 15724–15736, 2013. W. Klövekorn, A. Tepe, and U. Danesch, “A randomized, double-blind, vehicle-controlled, half-side comparison with a herbal ointment containing Mahonia aquifolium, Viola tricolor and Centella asiatica for the treatment of mild-to-moderate atopic dermatitis,” Int. J. Clin. Pharmacol. Ther., vol. 45, no. 11, pp. 583–591, Nov. 2007. Z. D. Draelos, M. H. Gold, M. Kaur, B. Olayinka, S. L. Grundy, E. J. Pappert, and B. Hardas, “Evaluation of an onion extract, Centella asiatica, and hyaluronic acid cream in the appearance of striae rubra,” Skinmed, vol. 8, no. 2, pp. 80–86, Apr. 2010. J. Á. García Hernández, D. Madera González, M. Padilla Castillo, and T. Figueras Falcón, “Use of a specific anti-stretch mark cream for preventing or reducing the severity of striae gravidarum. Randomized, double-blind, controlled trial,” Int. J. Cosmet. Sci., vol. 35, no. 3, pp. 233–237, Jun. 2013. M. Haftek, S. Mac-Mary, M.-A. L. Bitoux, P. Creidi, S. Seité, A. Rougier, and P. Humbert, “Clinical, biometric and structural evaluation of the long-term effects of a topical treatment with ascorbic acid and madecassoside in photoaged human skin,” Exp. Dermatol., vol. 17, no. 11, pp. 946–952, 2008.